In a LinkedIn Case Study, Replicon received an increase of 400% more leads within target audiences (vs. lead generation efforts on other platforms). Company: You run your LinkedIn ads from your company page. This means the first thing you need to do is make sure that your company page is set-up correctly. This includes ensuring that all key fields are completed, your page is search engine optimised (this will reduce your ad spend) and the correct administration accesses are in place. Clarity: There must be clarity around your audience. Know your perfect profile prospect. The targeting of LinkedIn ads is quite comprehensive. But for it to work you need to have clarity around who your ads are targeting – your perfect profile prospect. 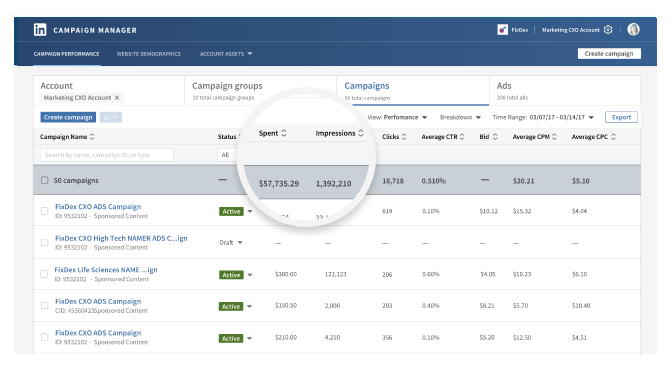 Campaign: Campaign manager is where you set-up and run your LinkedIn ads. Before you can run your LinkedIn ads you need to set-up your campaign manager correctly. You also need to know which of the 3 types of ads would suit your business – Sponsored Content, Sponsored InMail or Text Ads. Controls & Projection: Know your budget and projection. The key to an effective LinkedIn Ads campaign is Return on Investment (ROI). This means knowing your total ad costs and how this covert to your total customer acquisition cost. Content: You need to develop content for your ad. This includes your text and image. You might also need to create content for the ad offer. By setting up your company page, having clarity around your audience, a campaign established with controls and projections, and the right LinkedIn ads content, you can grow your business using LinkedIn Ad’s. LinkedIn advertising lets you scale your LinkedIn marketing, attract more leads and prospects on the worlds largest business-focussed social media platform. LinkedIn advertising is currently underutilised. This means there is an opportunity for you to leverage LinkedIn ads. The targeting options in LinkedIn ads means that you can talk directly to the decision makers. LinkedIn is the platform for advertisers targeting other businesses or decision makers. To get the most out of LinkedIn ads you need to calculate your return on investment and total cost of client acquisition. The minimum costs for LinkedIn Ads are $10 daily budget per campaign or $10 total budget per campaign. Direct Sponsored Content is a sponsored update that does not appear on the company page. It appears in the newsfeed of your targeted audience. With sponsored content, you only pay when someone clicks on your ad. Do You Need A Company Page? Yes, to run LinkedIn Ad’s you need to have a LinkedIn company page.